Xadrian is a factory complex calculator for the games X³: Terran Conflict and X³: Albion Prelude. 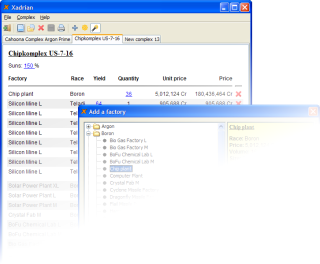 With this tool you can plan your factory complexes before you build them in-game. Knows all factories and sectors of a regular unmodified X3TC or X3AP game. Also includes the X3TC bonus sector "Harmony Of Perpetuity". Optional automatic base complex calculation. Load, save and print your complexes. Sun power is configurable per complex. Complex can be connected to a sector for automatic sun power configuration and calculation of next ship yards where the factories can be bought. Easy creation of mines. Just add a mine type and then enter as many asteroid yields as you want. Export to plain text and export/import of complex template codes for easy exchange of complex information via email or forum. Cross-platform GUI application. Runs on any platform supporting Java SE 6 or higher. Native look-and-feel on Windows, Linux and Mac OS X. Theme is configurable. (2013-05-28) Xadrian version 1.5.1 now properly supports the new ice mines from X³: Albion Prelude 3.0. Xadrian is written in Java and needs at least the Java SE 6 Runtime Environment. If you like Xadrian, please consider making a small donation to support my work on free software like this. Thank you! If you have any problems with Xadrian or find bugs in the software or this web site (even if it's just a typo) then please let me know by creating an issue on GitHub. Copyright © 2009-2013 Klaus Reimer. All Rights Reserved.